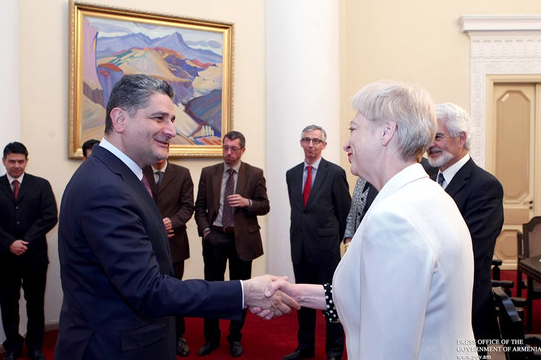 Members of European Parliament’s EU-Armenia Friendship Group, headed by President Eleni Theocharous met with the Prime Minister of Armenia, Tigran Sargsyan. Mr Sargsyan welcomed the delegation and expressed the hope that the future activities of the Friendship Group will contribute to the further development, cooperation and an expansion of bilateral ties between Armenia and the EU. 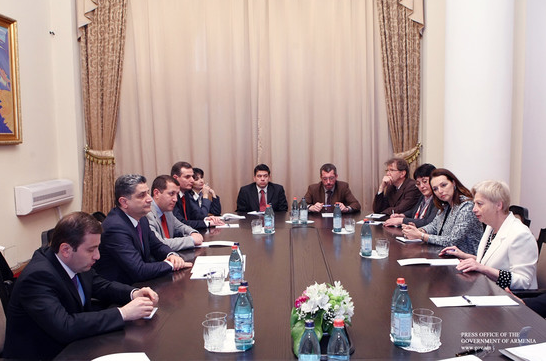 The parties discussed the economic development in Armenia, Armenia-Turkey relations, issues related to the Nagorno Karabakh conflict, Armenia’s future energy strategy and the situation of Syrian Armenian immigration to Armenia. On the issue of Armenia-Turkey relations the Prime Minister Sargsyan highlighted Armenia’s interest to establish diplomatic relations with Turkey, emphasizing the fact that the policy of the country towards Turkey has changed over the last 20 years. He went on to state that although Armenia is keen, however the overlying tensions within the region still pose an obstacle to achieving this goal. On the issue of Nagorno Karabakh, the Prime Minister affirmed that Armenia will stay dedicated to working within the framework of OSCE Minsk Group and is willing to make consistent efforts to achieve a peaceful settlement. When discussing energy, the Prime Minister elaborated on Armenia’s desires to continue using nuclear power as an energy source, but underlined the desire for the country to eventually decommission its current Metsamor power plant and construct a newer more modern nuclear facility. Regarding the immigration of Syrian-Armenians’ to Armenia, the Prime Minister enforced that the country is doing its very best to ensure the well being of the new Syrian Armenian population, and is doing everything it can to integrate them into society. The members of the Friendship Group stressed the importance of the support shown to the Syrian immigrants in Armenia by international institutions and the governments of their countries and expressed willingness to contribute to that process.